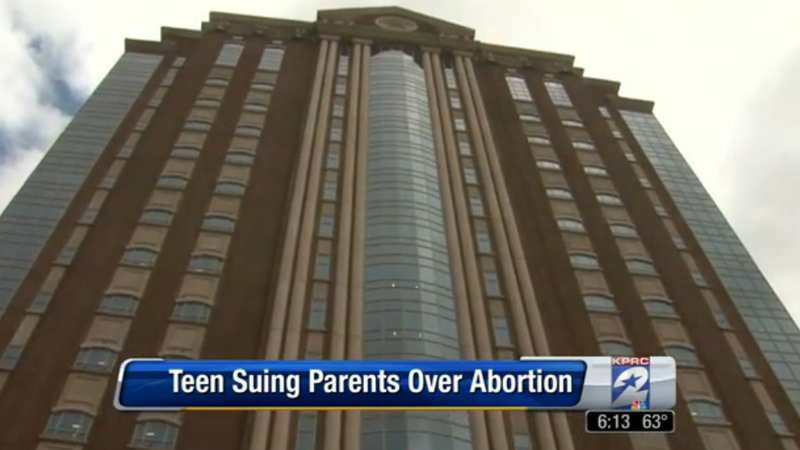 The parents of a Texas teenager are trying to physically force her to have an abortion, according to a new lawsuit filed by the 16-year-old girl, who is two months pregnant and is represented by lawyers with the Texas Center for Defense of Life. "We were asking judge to stop them physically forcing her to have an abortion. She is legally protected. They cannot drag her to get an abortion, force an abortion on our client," attorney Stephen Casey told Click2Houston. The lawsuit claims the teen's mom "... invited the paternal grandparents to a bar for further discussion, where she suggested that she might slip her an abortion pill through deception" and that her father told her "he was going to take her to have an abortion and that the decision was his, end of story." The frustrating thing about this case from a reproductive rights perspective is that anti-abortion advocates are totally going to bring this poor teenager up every time legislators fight to push abortion restrictions related to minors/anti-abortion bills in general, on the basis that most parents (and wicked abortion providers) out there would love nothing more than to force abortions via tactics commonly used by rapists with roofie connections. But the lawyers are actually arguing that the teen is free to decide to keep her baby under state law and provisions of Roe Vs. Wade which — drumroll, please — gives women the right to make their own reproductive choices.